We are planning our West Coast Wedding Reception right now! Some friends and family were unable to attend our wedding in Athens, Georgia so my mom and stepdad are hosting a party at their house in Columbia, California (a wacky 'ole gold mining town/national park). I just made some invitations for the party as well as maps of the town. I used the same paisley design as I did for the wedding stationery and made a cut out pocket holder. 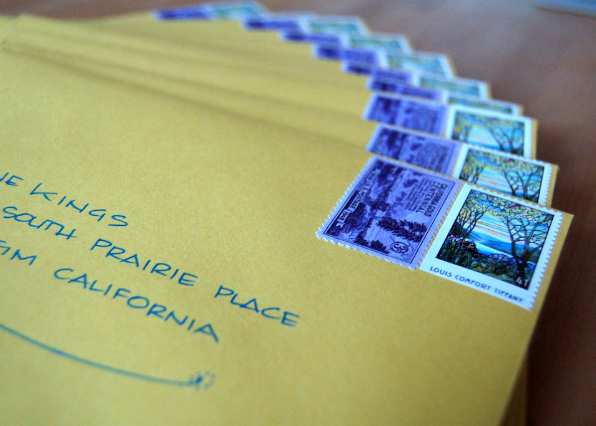 Yellow envelopes, vintage stamps and addresses in blue complete the invitations. I'm so excited to offer my handwriting skills & services to you! It's the perfect alternative to script calligraphy. I do a fun architectural style writing. This is great for any event! The cost is $1.50 per front and $.50 for the return address. I can also help you find the perfect vintage stamps to jazz up your invitations. This service does not include the cost of envelopes or stamps. Kindly include extra envelopes to allow for mistakes; 10 per 100 is ideal. Please allow 10 days per 100 invitations. 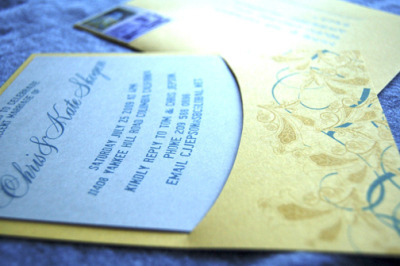 Please don't wait until the last minute... invitations should be mailed 6-8 weeks prior to the wedding. Email me for more information.